The Curtiss SB2C Helldiver was a dive-bomber that was at best mediocre and at worst more lethal to its crews than the enemy. The plane was born from a 1938 specification for a dive bomber to replace the SBD Dauntless that was just entering service. Curtiss had no problems with most of the specifications except for one, the ability to put two planes on a 40x48 foot elevator. This resulted in the plane being unstable in flight due to its fuselage being too short. Curtiss tried to fix this by using an oversize tail and horizontal stabilizers which somewhat worked. The prototype crashed twice during the testing phase, the second one in December 1941, due to right wing and tail failure which resulted in the plane being destroyed. That didn’t slow the Navy down as it ordered had ordered 370 planes before the prototype was finished. The first production SB2C-1 took its place in June 1942 and it crashed in a dive test six months later. Curtiss had to make so many changes during the production of the dash 1 that a modification center was set up and the planes were modified as they came off the production line. Then the fun really started as the Helldivers started reaching the fleet in November 1942. VB-9 and VS-9 on the Essex equipped with the Helldiver but issues getting carrier qualified meant that they re-equipped with SBD’s. Then the Bunker Hill’s dive bomber squadrons got the Helldiver next and since the Bunker Hill wasn’t finished they were able to get the planes worked up. Eventually the SB2C replaced the SBD by the summer of 1944. The Helldiver was not quite the performer the Navy wanted as it was underpowered and a little short on range but once a more powerful engine was introduced on the SB2C-3 and the perforated dive brakes were introduced on the late production dash 3’s and Helldiver became an adequate dive bomber. The plane’s biggest problem however was timing. The Navy was learning that the dive bomber as a type was becoming obsolete as the Hellcat and Corsair fighters could carry the same bomb load farther and were superior combat planes once the bombs were dropped. After the war, the Helldiver was the standard carrier based bomber until it was replaced by the Douglas Skyraider. The Helldiver was phased out of front line service by 1950 and was out of the reserve squadrons a few years later. The plane was exported to France and Italy after the war but was retired from both navies by 1957. 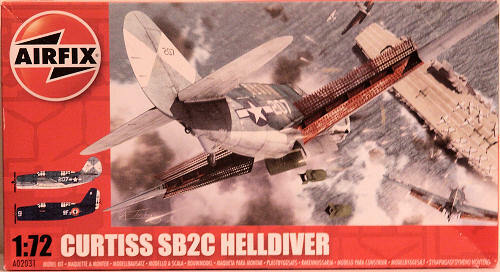 This is the latest release of Airfix’s venerable Helldiver. The k it dates back to 1968. 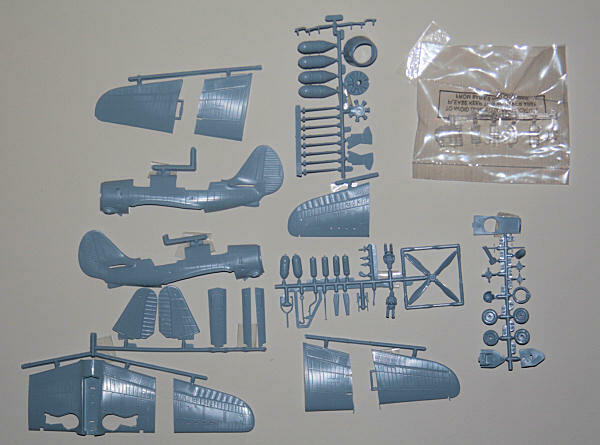 The kit has 76 parts on 6 gray sprues and 1 clear sprue with the fuselage halves separate and looks like a decent little kit. The construction steps look fairly straight forward in the instructions. The surface detail screams old school as instead of panel lines you get lines of very finely raised rivets. It does look the father of Trumpeter’s mad Chinese riveter was in charge of the surface detail as I doubt the real thing has that many rivets. There are some raised panel lines on the cowling and control surfaces but they are very restrained. Overall, it should look fine under some primer and paint. You get an option to open the bomb bay and the option of folding wings but the detail is a bit sparse. You do get the option for 8 rockets under the wings, 2 bombs or two drop tanks mounted just outboard of the landing gear. You also get a couple of decent looking crew members but seeing as how the cockpit starts and ends with them leaving the figures out are not an option. The kit gives you the canopy options to do a dash 4 or a dash 5 but the prop looks like the paddle prop from the 5 and will need about 5 minutes of attention with a sanding stick to look like a dash 4 prop. 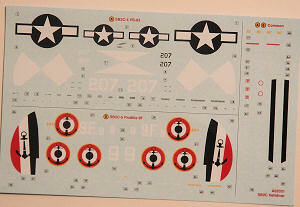 The kit gives you two decal options, a dash 4 Helldiver from VB-83 on the Essex from April 1945 in the tricolor scheme and a French dash 5 from Flottille 9F from the carrier Aromanches in 1952 in overall Gloss Sea Blue. The decals themselves look good and are in register. The date on the Essex plane is a little off as I have seen pictures of VB-83 painted tricolor in March of 1945 and GSB in April so you could go either way and be right. The kit is a nice little plane. It certainly looks like a Helldiver and while the detail is lacking, it is less than 10 bucks retail so I’m willing to be forgiving of its lack of detail. It looks like a forgiving build for a novice builder or a fun little weekend build for a more experienced modeler.